A Hammer – Edward G, Whiting production released by Exclusive Films. Ernest Dudleys famous character of “Monday Night at Eight”. Adapted from a play by Wilfred Burr. Heiress Cynthia Mason disappears in mysterious circumstances just as she is about to come into her inheritance and elope with her boyfriend, Peter Lorimer. 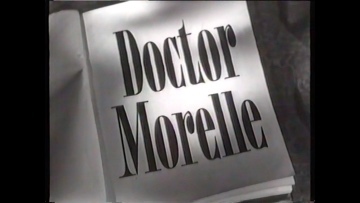 Worried by her disappearance, her friend Miss Frayle, who is also assistant to amateur detective Doctor Morelle, takes it upon herself to investigate. Masquerading as a housemaid, Miss Frayle travels to Cynthia’s remote West Country mansion home, where she encounters her friend’s intimidating, wheelchair-bound stepfather, Mr Kimber. With his distinctive, deep, resonant voice, Valentine Dyall was often called on to play sinister roles, including those of Dr Fell in Hammer’s “Room to Let” (1949), long dead warlock Jethrow Keane in “The City of the Dead” (1960 with Christopher Lee), grim caretaker Dudley in Robert Wise’s “The Haunting” (1963) and, in later years, The Black Guardian in BBC TV’s “Doctor Who”. Hugh Griffith, who plays the butler, Bensall, in this film, went on to win a Best Supporting Actor Oscar in 1959 for his role as Sheikh Ilderim in the epic movie “Ben Hur”.